Dyeing fabric is such a simple decorative solution that it is often overlooked. Yet what could be easier when faced with a plain white or off-white fabric or trimming than to dye it your chosen colour. It will be transformed in as little as half an hour. Ready-made hot and cold dyes for the home market are designed to be as easy to use as possible, and they produce excellent results. They are also cheap and widely available. Yet before the invention of coal-tar-based dyes in 1856, by the English chemist William Perkin, dyers had to extract colours from natural sources such as vegetables, bark and fruit. This was a time-consuming and sometimes costly task. Fixing the colour was an even greater challenge to the early dyers. Many natural dyes are not fast unless the fabric has been treated with a chemical, known as a mordant, which enables the fabric to take the dye permanently. Commerical hot and cold dyes do not require a mordant – simply ensure that the fabric is clean and free of any finish that might interfere with the absorption of the dye. Salt must be added to the dyebath (the amount is given in the instructions that come with the dye) and commercial cold dyes also need to be fixed after the fabric has been immersed in the dyebath. Although ready-made dyes offer excellent value for money, it can be fun to try natural dyes. While not always as strong or bright as chemical dyes, they pro­duce far more subtle tones. Woollen fabric retains colour for longer than most other fabrics. Tea and coffee are classic home-made dyes that are fast without a mordant. Vegetables produce sub­tle and attractive colours; the outer leaves of cauli­flower, finely chopped and boiled for about for 15 minutes, will produce a gentle pink colour. Onion skins produce a strong yellow if they are heated in water for about 40 minutes, and the leaves and stalks of parsley will give a pretty yellow-green colour if they are chopped finely and heated for 20 minutes. If you use a vegetable dye, you will need to mordant the wool beforehand. The vegetable dyes mentioned above require a mordant of tartaric acid and alum. Generally, when mordanting wool, you need to sim­mer the fabric for at least two hours and then rinse thoroughly, starting with very hot water and then gradually using a cooler and cooler rinse. When you place the fabric in the dyebath, the water should be the same temperature as the last rinse. 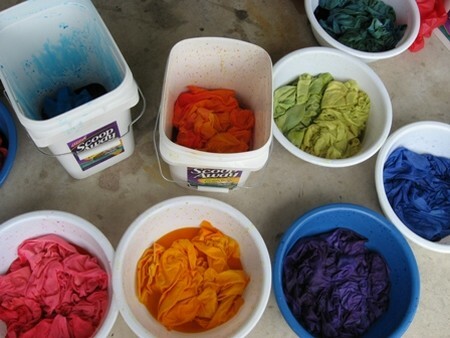 If using veg­etable dyes, you must boil the dye solution. Boil the water and pour it into the mixing bowl. Add the two tea bags and allow to brew for a couple of minutes. Immerse the fringe in the dye­bath and stir with the wooden spoon. Leave the fringe in for 10 minutes, turning the fabric from time to time to ensure it dyes evenly. Pull the fringe out of the dye bath with the wooden spoon. It will have dyed a very light biscuit colour. If you leave the fringe in for 1 hour, it will dye a much darker colour. Hang the wet fringe up to dry.